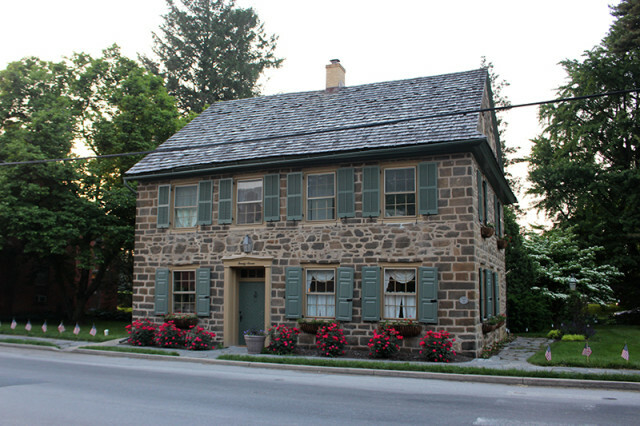 Over the last couple of weeks, I’ve shared part one and part two of our road trip through Pennsylvania last month. We were only gone for five days but were able to fit lots of toddler-friendly fun into it. Sometimes a vacation doesn’t need to be long in order to be a nice break. 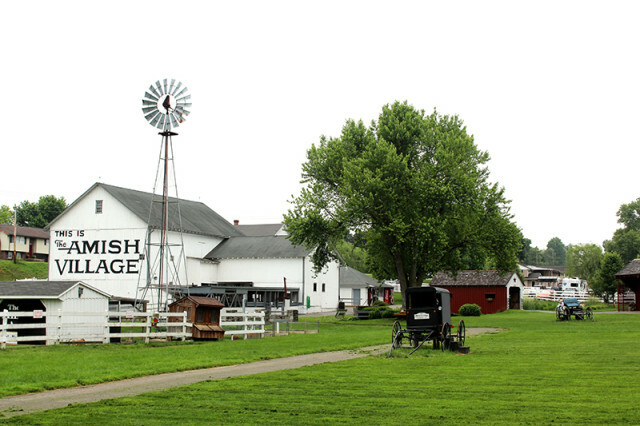 For the last couple days of our trip, we stayed in the small town of Strasburg in the beautiful Amish farmland of Lancaster County. We met a lady on our trip who highly recommended we visit this adorable country store run by an Amish family, that was only a few minutes from our motel. They had homemade baked goods and snacks (Garrett and Lucy loved the chocolate chip cookies), along with beautiful locally made baskets, furniture, toys and more. 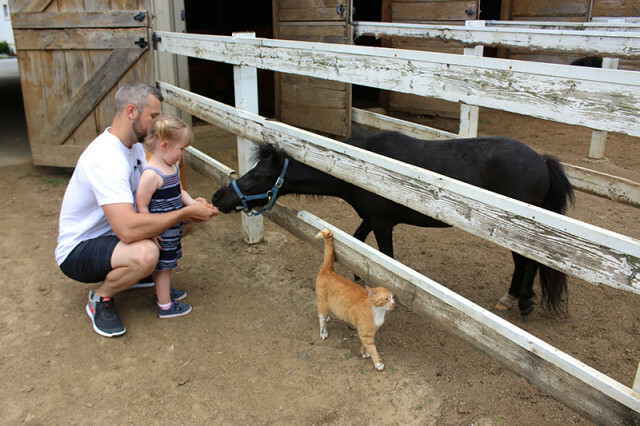 I picked up a few things for our farmhouse, but the real highlight of the visit there was seeing their cute miniature horses. 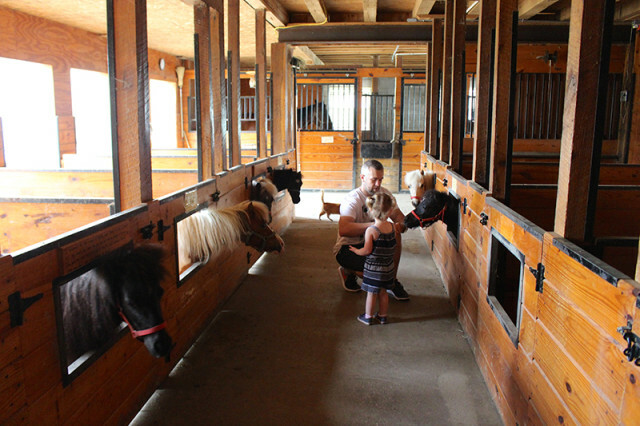 In a little barn at the front of their property, they have stables with the sweetest, friendliest miniature horses that you can feed and pet. Our animal loving toddler was in heaven. She couldn’t believe she was able to get so close and pet them. 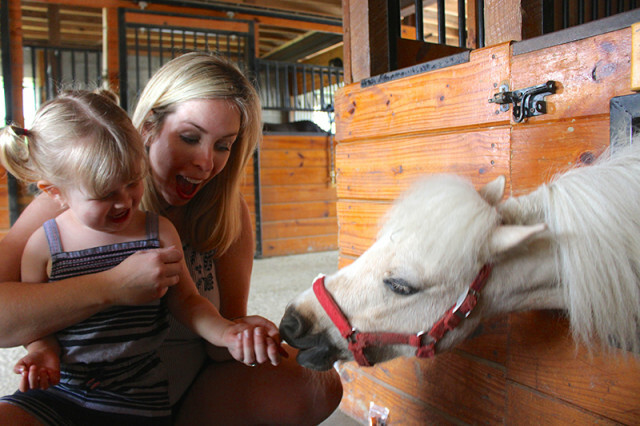 We helped her feed them as well, and she insisted that every horse got something, ha! 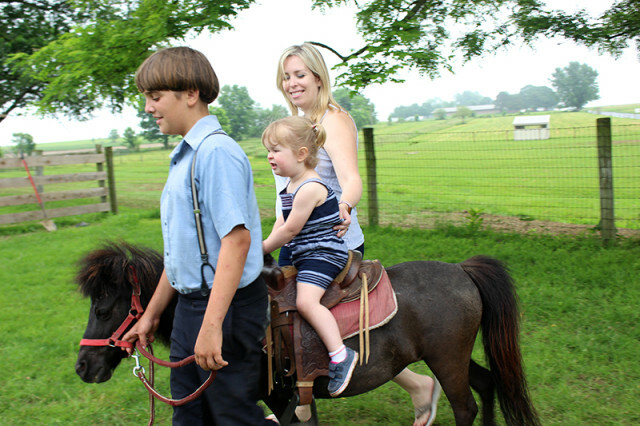 For only $6 you can take one of the horses for a little ride around the farm, so we thought it would be fun to treat Lucy to her very first ride. As soon as she got on the saddle she said “Giddy up horse!”, ha! The boy who was guiding us said “oh does she go on horses often” and we all had a good chuckle about how she knew right away what to do on her first time. She even grabbed the reins at the end and tried to walk him to our car, like she thought he was coming home with us, ha! It was hardly an hour of our trip, but the visit to this store and their miniature horses was definitely a highlight, especially for Lucy. Definitely worth a visit if you’re in the area. 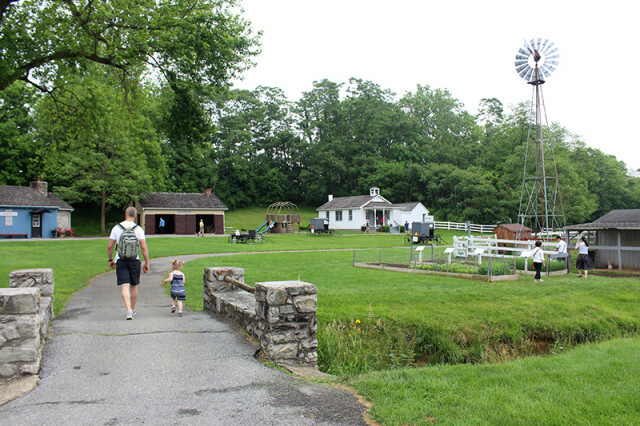 My in-laws had come through the Lancaster area recently and they recommended we take Lucy to The Amish Village a few minutes away in Ronks, PA.
It’s a nice little museum where they give you a tour of a traditional Amish farmhouse and village. Do you see that little bridge that Garrett and Lucy are walking over? Well, I stopped in the middle of it to take a picture and took my hands off the empty stroller for one second and…. 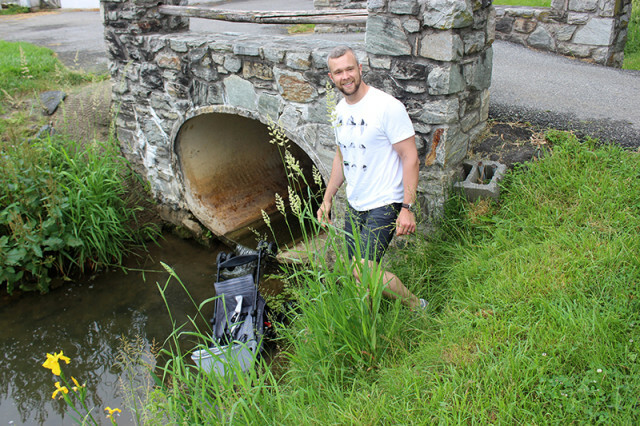 …the slope of the bridge meant it rolled right down the bridge, around the corner, over the grass, and into the creek. All I can say is that I’m glad nothing was in it (aside from our rolled-up umbrella we lost int he creek). My hero jumped in and scooped it out and we had a good laugh about it. The rest of our walk around the village was (thankfully) uneventful, ha! 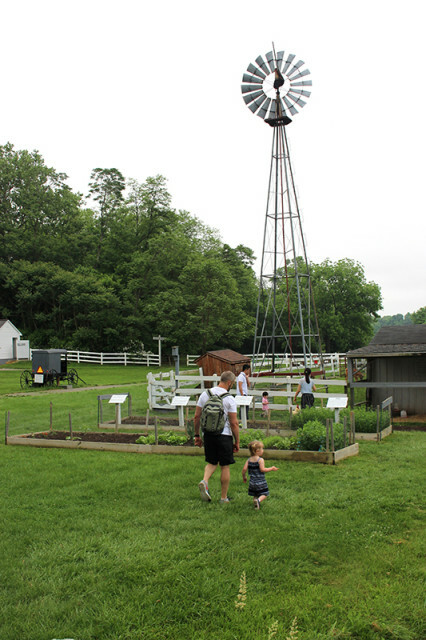 We visited the vegetable gardens (getting some inspiration for our own) and looked at all the farm animals. 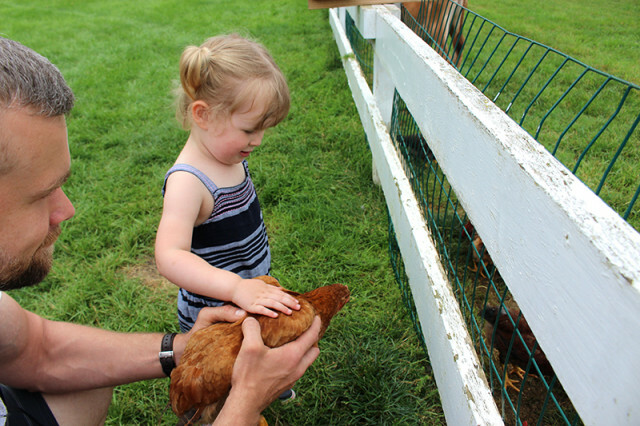 Of course, Lucy was drawn to the chickens right away. You’d think she’d have enough of it with our own at home, but she just adores them. She was telling this one that she was “so pretty” as she pet her. 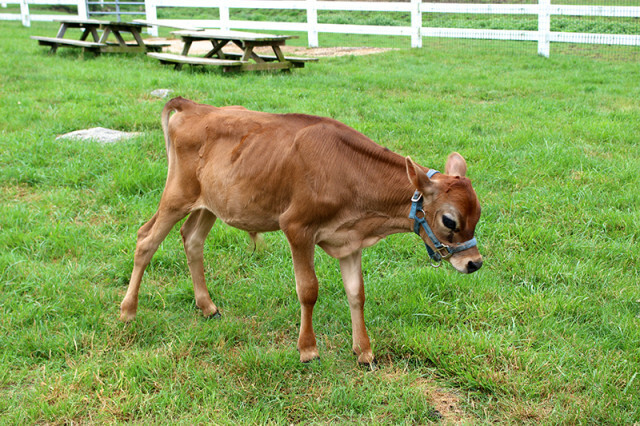 Meanwhile, I was fawning over the adorable Jersey cow calf with her big doe eyes. Maybe someday I’ll convince Garrett just how much we need our own, ha! 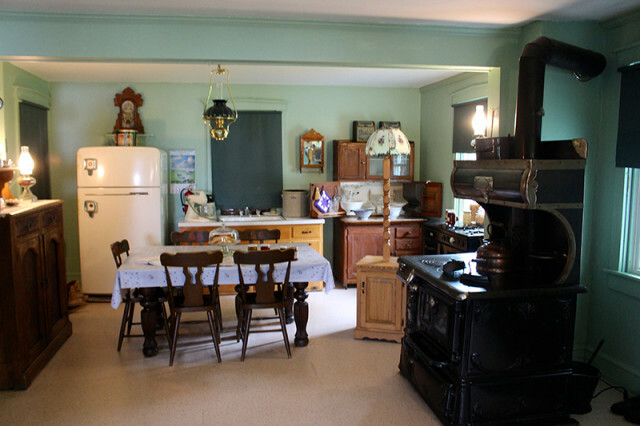 The tour inside the farmhouse was really interesting, especially how they work around using electricity in the kitchen. All the appliances run off of propane or water power. Even that lamp has a propane tank underneath to give them light in the evening. 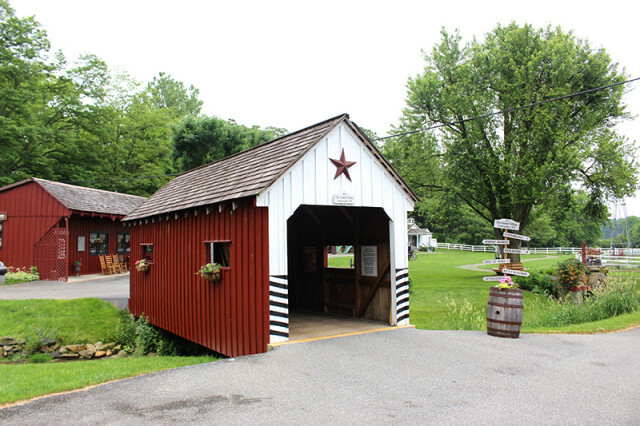 And of course everyone needs a little covered bridge in Lancaster County. 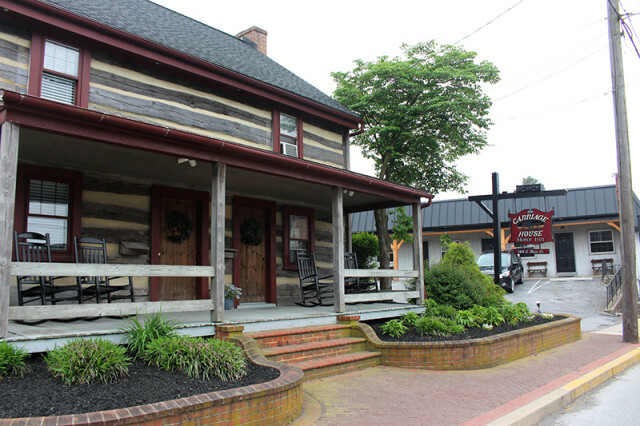 When we were looking for a place to stay for this last leg of our Pennsylvania Road Trip, I came across the lovely historic town of Strasburg, just outside of Lancaster. 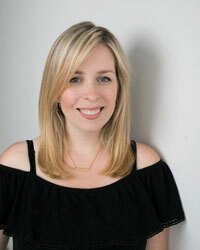 From when we stayed with our friends Erin & Ben in Laurel, Mississippi, we’ve learned that we really love to not just visit small towns, but stay in them too. You get such a different experience than when you’re in the city or in a big hotel on an interstate. 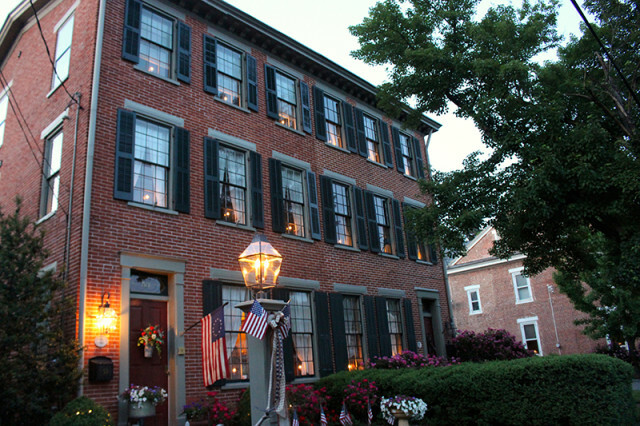 Founded in 1693, Strasburg is full of lovely older homes and shops. We had a lovely time walking around in the evenings, exploring all the little streets. We really got lucky with our accommodations too. I found the recently renovated Carriage House Motor Inn, and it was unlike any motel we’ve stayed at before. The room was clean, modern and fresh, and you could see the owners and managers had put so much work into making it a great space. It was also really reasonably priced and included breakfast at the nicest restaurant across the street. 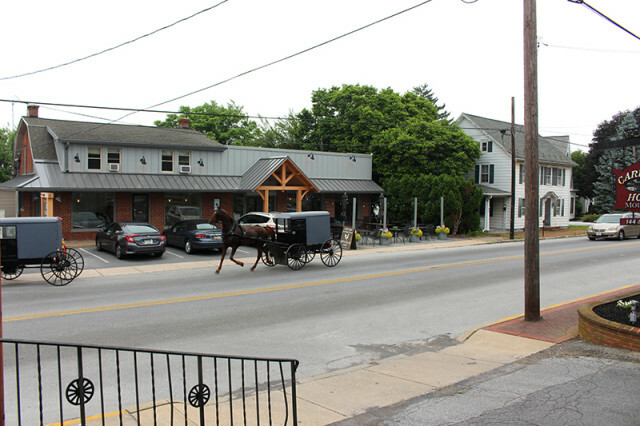 The Speckled Hen was right across the road (with lots of Amish buggies going by to keep Lucy enthralled) and had great breakfast sandwiches (try the egg cheddar croissant) and great home goods too. 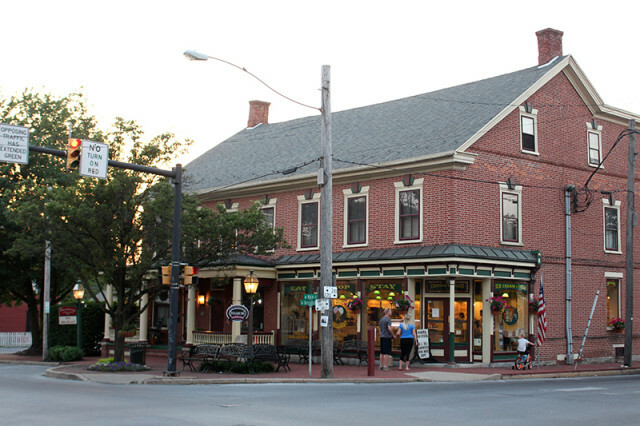 A short walk down the street and you find the crossroads of Strasburg, with little shops including the creamery where we did our ice cream gender reveal. We were walking along one evening and spotted this lovely house with a porch similar to ours and stopped to take a picture of their porch swing. Just as I was taking it, the owner happened to walk down the street with his family and we were busted, ha! 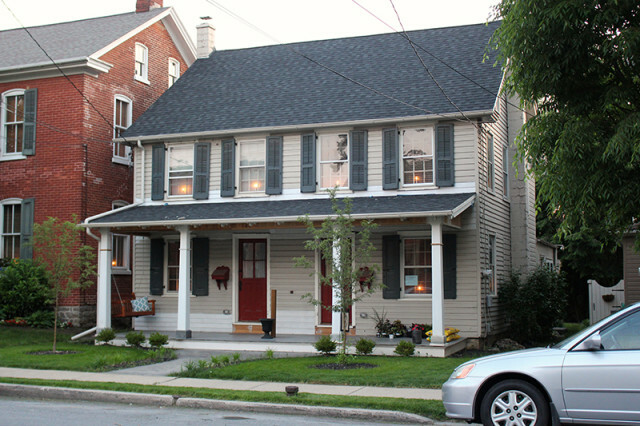 We ended up having a lovely chat about restoring old homes and the labour of love. It was really nice to be over 450 miles from home and run into people like us. 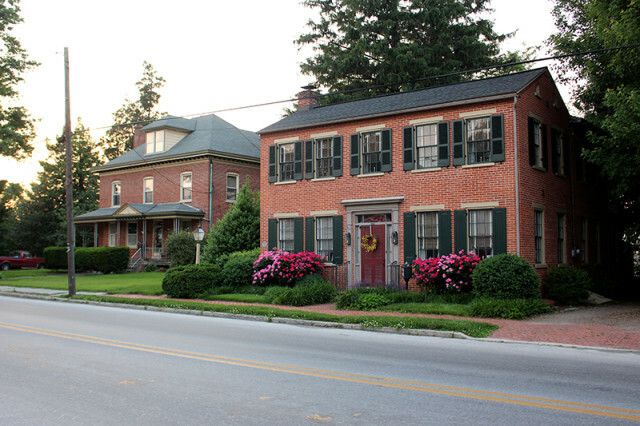 Strasburg ended up being the perfect spot to stay in the Lancaster area – a quaint town that was just a short drive to all the attractions we were visiting and there was so much more that we didn’t even get to see. If you’re into trains, this place is insane with how many museums and shops there are. There was a huge outlet mall right nearby too and I was able to find a few goodies to bring home with us. 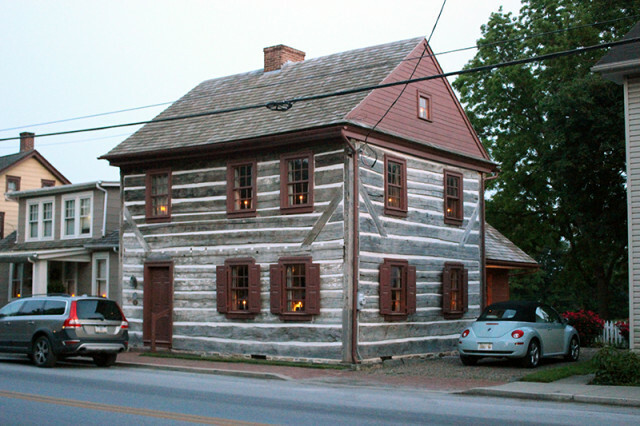 We also made the drive into the city of Lancaster for dinner one night and it wasn’t very far at all. We’ll definitely be back again someday. On our way home, we also stopped into Hershey, Pennsylvania for a quick stop for the free Chocolate Factory Tour at Hershey’s Chocolate World. I had been there as a kid (and still remembered the Hershey Kiss shaped lamp posts), and it was nice to take my family for a little stop there too.